Learn here what are the best cartridges for you, which are next to the printhead or individual cartridges to the head. 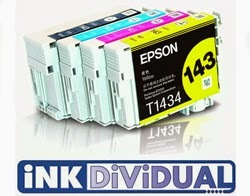 It a great saving and innovative system to do ink cartridges, all the Epson inkjet printers use individual cartridges. These cartridges are pigments and they are known as DURABrite®, you can get it in printer using four cartridges as the multifunction domestic and the photographic printers using six cartridges of this individual type. These type of cartridges are considered a great saving because if one of them run out of ink all you have to do is to replace just that one. It is normally seen in other ink cartridges for example the tricolor cartridge if it runs out of yellow color you will have to refill the entire cartridge or replace it completely with all the other colors. In contrast if an Epson cartridge runs out ink of any color all you’ll have to is to refill or to buy the emptied cartridge. These ink cartridges do not have integrated head, they just work with ink tanks for the internal system of the printer, this system takes the ink from the cartridges to the head inside the printer to process the ink and perform the printing, another advantage of using this type of cartridge is that ink won’t get dried inside the cartridge. Thus because the cartridges are completely sealed and inside they have sponges as other brand cartridges do. It is worth noting the resistance when talking about installing a continuous ink system with these cartridges, it is known that it could be difficult to manage a system that is not linking colors when the cartridge has the three colors ink together, as it been said before these cartridges has ink in a separate way and you can forget about having problem with color printings different from how they are shown in the screen. Any problem that shows up at the least expected day with an individual cartridge can be easily solved thanks to the modern Epson software interface which allows you to perform a cleaning of any individual cartridge quickly solving a problem with a specific cartridge.